After trying to strengthen their presence at the premium end of the television market for 3D TVs, top electronics firms are also betting on scaling up their product portfolio with a complimentary product in the home theatre segment. Sony and Samsung among the top brands have recently launched new 3D Blu-ray home theatre systems in the Indian market; here's a look at them. Sony India has launched a new range of 3D Blu-Ray home theatre systems called BDV-E980 and BDV-E880 and a Blu-ray player BDP-S380. 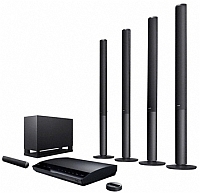 The home theatre systems have almost identical features other than the fact that BDV E980 has four speakers while the BDV-E880 comes with two speakers. 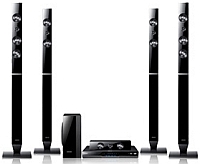 They offer 3D picture and 3D surround sound and the total power output (RMS) of the systems is 1000 watts. Both have Wi-Fi capability, 2 HDMI inputs and 2 USB ports and can play formats like BD, DVD, CD, MP3 and AVI. The Blu-ray Disc player can play video formats like BD, DVD, CD, AVCHD, XVid HD, JPEG and MP3 plus connect to the internet and stream movies, music and videos from YouTube. Additionally if you download the free "Media Remote" app, you can turn your iPhone, iPad or compatible Android phones into a remote control. The company also claims that the Blu-ray player can up-scale DVD formats to near-HD quality picture with the help of the Precision Cinema Upscale via HDMI feature. BDV-E980 and BDV-E880 are priced at Rs.39,990 and Rs.29,990 respectively while the BDP-S380 Blu-Ray player is available at a price of Rs.8,990. Samsung's HT D5550 comes with a 3D package, which integrates 3D Sound Plus with 3D pictures improving the visuals while Samsung's proprietary 3D sound DSP (Digital Signal Processing), 3D Sound Plus with horizontal surround and 3D Depth Sound effect enhances audio. It can convert 2D films into 3D visuals and Samsung has come out with a new feature called HyperReal Engine which will improve the depth and clarity of the visuals according to the company. Also, the Smart Hub brings online content to the user in the form of access to YouTube and more and Samsung's high definition multimedia interface (HDMI) delivers uncompressed HD content. Additionally, Samsung apps along with built-in Wi-Fi and AllShare will enable users to create a wireless home network. There is also a Karaoke feature available for music enthusiasts in the home theatre system which can record and store the Karaoke sessions. The HT-D5550 is available for a price of Rs.49,900 while there are a few cheaper home theatre systems available, like the HT-C755W and the HT-D555 that are priced at Rs.42,000 and Rs.34,900 respectively. Although these devices are touted as 3D Blu-ray home theatre systems, users can also play 2D content on them and since they are essentially for playing 3D content, they will provide enhanced quality visuals for 2D and high definition 2D content. But users have to keep in mind that to play the 3D content effectively, a 3D TV is mandatory. So buy these home theatre systems only if you already have a 3D TV at your home and want to enhance your 3D experience. So What Does It Mean For You And Me: These are neat packaged products for the early adopters of technology, though such products also come attached with a higher price tag.